Our Raleigh NC office coffee machine rentals are the best way to show your customers and clients that you care! We take care of everything from filling the coffee machines, to customizing the coffee options to your liking. With Gourmet Grinders Coffee Service machines, your customers and clients will have access to local, organic, freshly roasted coffee brewed for every cup. 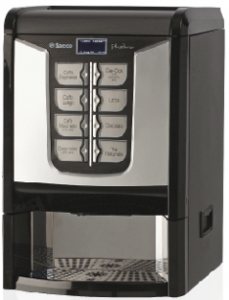 We have 2 options for businesses looking to add a full service coffee solution to their office. The Total Lite is an excellent choice for any business looking great coffee with endless options and features! This not only provides different types of coffee drinks, but different bean options as well! This machine provides the ultimate gourmet coffee experience for users who want to treat their customers and employees with the best coffee. Sleek looking machine and compact design will fit in any office break room! The Phedra coffee machine is a great option for businesses that want to offer exceptional coffee to their customers and employees. This machine provides an amazing coffee experience for users who want to treat their customers and employees. Watch One Of Our Raleigh Coffee Machines! If your company wants to make a statement to employees, visitors, and customers of how much you value their contribution to the success of your business – then you should consider using Gourmet Grinders Coffee Service. If your current office coffee isn’t exceeding your expectations, fill out the form on the right for a FREE TRIAL of our office coffee machines in Raleigh!